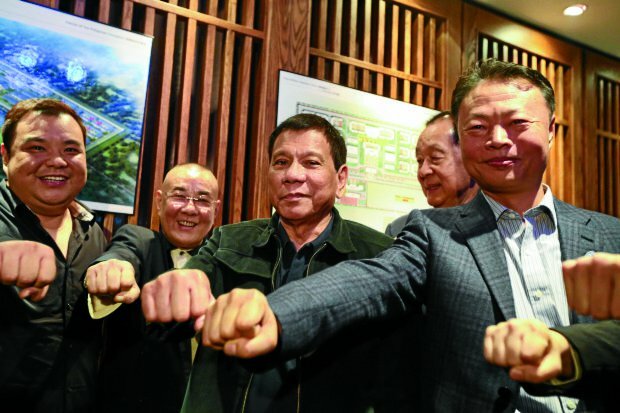 President Rodrigo Duterte doing the fist-bump with his foreign hosts. Following is the letter to me dated Oct. 24, from a European former executive who had been doing business here and who has since chosen to settle in the Philippines. This gentleman has written to this blog a couple of times in the past in reaction to certain issues here, and I have published some of his commentary. It is clear that he has gotten to love this country of ours and is very sincere in wishing the Filipino people well. As far as this expat is concerned, however, the tough attacks leveled by the President against the traditional friends of the Philippines and the “flip-flopping” statements of some members of his Cabinet hurt the country in the eyes of the world. It's really time for the President to tighten up his pronouncements and get into one act with his Cabinet. I maintain that Mr. Duterte needs less of the services of a "Department of Clarification" as proposed by fellow Mindanaoan, Fr. Eliseo Mercado of the OMI, and more of a true and meaningful consultation with his Cabinet and other sectors who could contribute to a real dialogue with him. A prayer for Mr. Duterte's success in governance is currently making the rounds of social media and we could all join in that prayer, as his success will redound to that of our country. “Just to let you know that I can't agree more with your latest 'PoliticalTidbits' dated October 23. It's hard to describe the feelings of a former European business executive residing in your country since the late 1990s, when listening to your President. Disbelief, despair, confusion ... What to say, what to think? How can we respect a leader who demands respect from the world but doesn't show any respect himself for other world leaders or peoples when they express concern about alleged human rights abuses in the war against drugs. “The American and European people have been called idiots, blamed for terrorism, the American president an s.o.b. and we all can go to hell. No need for aid from western governments. No, the new promised land and friends are China and Russia and Asian countries. One can only wonder what other ASEAN countries are thinking of the radical change of policy of their chairman in 2017 (the Philippines assumes chairmanship of ASEAN next year---BOC). “What can explain the often incoherent controversial statements of President Duterte? One thing is for sure. He has a very low tolerance for criticism---in particular from friends like the US and the European Union. For him it is a show of disrespect and hurting the dignity of the Filipino people. However, what about the dignity of the victims of extra judiciary killings. The mistakes of the colonial powers of the past should not be used to silence those who aim at creating a better world today. Advise from old friends should not be treated as disrespect. And what about the history of Japan, China and Russia? No atrocities? “It took more than three months for the local media to become more critical of the President. Not the extra judicial killings but the 'separation' (from the US) finally triggered the press and others to raise alarm about the foreign policy shift, looking for stronger alliances with China and Russia at the costs of old friends and the possible consequences. “In particular now China: contrary to what President Duterte has said about China never invading a piece of the Philippines, China has seized since 1995 the Mischief Reef and in 2012 Scarborough Shoal---thereby occupying Philippine territory, as confirmed by the Permanent Arbitration Court in The Hague. Moreover, it has been reported that the President has recognized the historical right of China about the South China Sea, which is a dangerous precedent and weakens the Filipino claims. “The controversial words of the President and the flip-flopping statements of Cabinet members do leave an impression of anti-Western sentiment, as also shown in his way of treating some Western ambassadors. The image of the Philippines is at stake. The victims of lower development assistance from Europe will be the Filipino people as most aid goes through NGOs and not to the Philippine government. “One last word about the so-called strings attached. No strings in case of China and Russia? Secretary Yasay's statements picturing the Philippines as being captive of Western foreign interests in ‘disguised chains’ also give rise to concern and require explanation. It's about time the President accepts the need for consulting those with experience in matters of state concerning security, foreign policy and trade and foreign investment. Can you tell this expat that he is a yellow cult. Tell him to shutup his advice is not needed because President Duterte had done so much change in just over 100 days. Instead of asking him to shut up, why don't you respond to his concerns? Shut up if you don't need any advise!